RESCHE, Catherine. 2013. 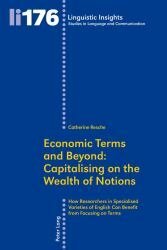 Economic Terms and Beyond: Capitalising on the Wealth of Notions. Collection "Linguistic Insights" n°176 Berne, Peter Lang. from metaphorical terms – Insights from indeterminate terms with relation to discourse – Insights from interface terms. Catherine Resche is a full-time Professor of English for economics at Panthéon-Assas-Paris 2 University. A member of CELTA (Centre de Linguistique théorique et appliquée) at the Sorbonne (Paris IV), she heads the «terminology and specialised discourse» research group in applied linguistics. She has authored numerous articles and book chapters on terminology, neology, metaphor and genre and discourse analysis.